Constant exposure to harsh environments and corrosive elements means that water and wastewater facilities need safety railing systems that stand up over the long haul under extreme conditions. Corrosion-resistant modular railings assembled on site provide cost savings for both installation and long-term use because of their flexibility and durability. Kee Safety manufactures strong and corrosion-resistant modular railing systems built from Kee Klamp galvanized steel or Kee Lite aluminum alloy fittings. They meet OSHA safety standards and lower costs compared to welded or other fabricated railings. The rail-fitted uprights are typically pre-assembled for shipment to the jobsite where they are anchored. Horizontal rails are then cut to the exact size needed, fitted through the uprights, and fastened by turning set screws built into the fittings. This can reduce lead times to a week or less compared how long fully-fabricated railings take. Precise measurements at the facility allow the rails to be cut-to-size. If dimensions change during installation or unanticipated situations are encountered, there is no need to return to the fabricator. Kee Safety modular systems enable installers to compensate for changes quickly and easily. Perhaps the most significant savings are labor costs. Installation and maintenance of modular railings do not require welders or other high-skilled workers. If a rail section is damaged, it can be replaced with ease compared to a welded rail. Modular railings also can be disassembled and re-installed to accommodate future construction and maintenance needs. Safety barriers, temporary or permanent, create order and separate people from hazards. 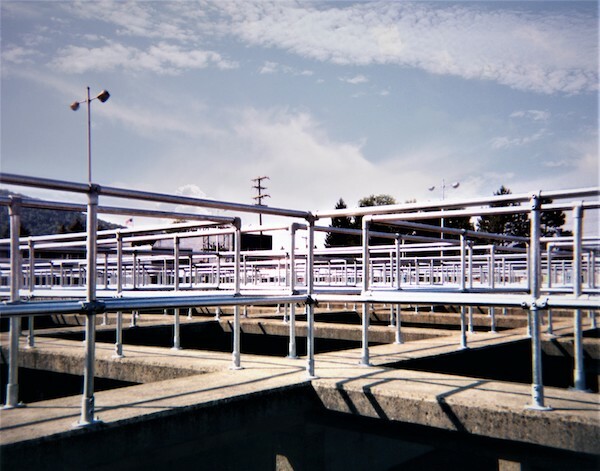 Kee Klamp and Kee Lite railing systems channel workers in the proper direction and minimize exposure to unsafe areas at water treatment facilities and wastewater management sites.